On Good Friday we stand and face the cross. A grim symbol of pain and suffering. Jesus’ death was the cost for our sin, the sin of thousands of years ago, of today, and of tomorrow. We rise up against God, again and again. And He welcomes us back with open arms every time, welcomed as beloved children. Through scripture, song and spoken word, we will remember the sacrifice made for us, which we are so in need of each and every day. We were each created with the capacity to choose, with intelligent minds and hearts, our maker set us free in the world. And in our humanity, we rise up against God. Our uprising leads to death, but Jesus’ uprising leads to life. On Resurrection Sunday we celebrate Jesus’ victory over death on the cross. The power of sin is broken for once and for all as we are reconciled with God. Forever we are changed, forever we are adopted into God’s family, and restored in the name of Jesus. Together we will lift our voices in gratitude and worship our King. 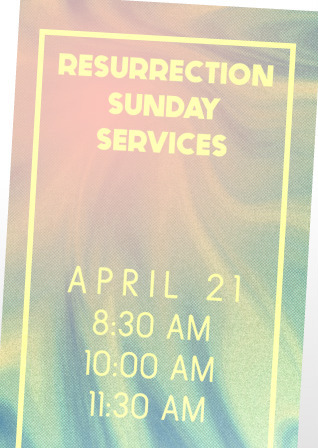 We will hear stories of resurrection in the lives of people in our community. And together we will declare HE IS RISEN.